Alain V. De Coster, C.E.C, C.C.A., Lecturing Instructor at Escoffier Restaurant at The Culinary Institute of America in Hyde Park, New York shares his culinary insight, passion for teaching, and a very tasty recipe for Poached Halibut Fillet, PEI Mussels, Manila Clams and Shrimp, Vegetable Julienne, and Saffron Scented Natural Broth. 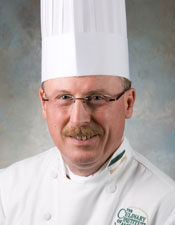 Belgian-born Chef Alain V. De Coster joined The Culinary Institute of America in 2008 after first honing his culinary career in Belgium earning a Bachelor's degree, certificates and culinary diploma with distinction from the Centre d'Etudes des Industries Alimentaires et du Tourisme, Brussels, Belgium, working at prestigious restaurants in Belgium and the United States, and he is the recipient of numerous culinary awards and distinctions including Ambassador to the United States, Master Chefs of Belgium, however it was his mandatory military duty in Belgium where he worked in the Belgian Navy as a cook aboard a mine sweeper, that I found to be especially intriguing. I met Chef Alain V. De Coster in November 2009 when I was attending classes at the school and having dinner at the award-winning Escoffier Restaurant, and learned that he is a chef who has no secrets from his students; he wants to share with them everything that he knows, which is what his mentors did for him. He encourages his students to ask questions as Escoffier Restaurant is the school's flagship restaurant and the customers have high expectations when they come to dine at the restaurant, and the students must meet those expectations. He advises students that it is not easy out there in restaurants, and that restaurants have to comply with rules and regulations, which is equally as important as the reviewing of deglazing, sauces, flavor profiles, and the need to build on the classic principles before the students graduate. Everyone working in a kitchen has a job to do, and the students that draw the duty of feeding the kitchen team, often feel that this is not an important job, that they would rather be cooking for the guests; however he stresses the importance of this job, which keeps the morale of the team going, something that he learned when he was a cook aboard the mine sweeper. The way we approach food and how we present it can have a great impact on the morale of the team, which is equally important in a restaurant as it is in the military. The students working at Escoffier Restaurant are in their final days before graduation and although he orchestrates what the students will do, it is the students that must produce and do the actual cooking. He stresses to the students that what they do has an impact on the guests beginning with the Amuse Bouche, which he refers to as the wow factor that sets the standard for the rest of the meal, to the pastry served at the end of the meal that creates the final wow factor for a great dining experience. Chef Alain V. De Coster is a dedicated and passionate chef who when not working on developing new recipes can often be found at a bookstore or in the library where he is always looking for information to expand his knowledge. As a chef, it is important to continually develop your knowledge basis, and he also likes to visit the local farms to learn what they are producing. He graciously shares his recipe for Poached Halibut Fillet, PEI Mussels, Manila Clams and Shrimp, Vegetable Julienne, and Saffron Scented Natural Broth to provide you with a delicious taste of Escoffier Restaurant. Bon appetit from Alain V. De Coster CEC, CCA, Belgian Master Chef Ambassador, Chef Instructor Escoffier Restaurant at The Culinary Institute of America. Needed: 4 deep soup plates (or your preferred china) and buttered paper (butter wrapping will do). Method: Preheat oven to 400° F (204° C). In a shallow poaching pan, loosely sprinkle the minced shallots and garlic. Place the halibut filets on top, season with salt and pepper. Cover with all liquid elements (no particular order). Bring to a simmer over medium high heat. Cover with buttered paper and transfer to oven. Cook until fish becomes firm to the touch (about 7 - 9 minutes pending on the thickness of the halibut fillet). When done, remove the fish from the pan. Transfer halibut to holding vessel. Keep in a warm place covered with the buttered paper until ready to serve (do not overcook the fish or it will become very chewy and dry). Transfer poaching pan to stovetop and add saffron to the poaching broth. Over medium heat, add the clams. Cover pan with lid. Bring liquid to a simmer. Cook for 2 minutes or so. Add mussels. Cook for another 2 minutes or until mussels open. Taste the broth. Look for a balance between salt, pepper and shellfish flavor, and of course, the distinctive scent of the saffron pistils. When cooked, remove the clams and mussels from the pan. Keep in a warm area until ready to serve. Add fennel, carrots, and celery to the broth. Cook for two minutes. Add leeks and shrimp. Cook until shrimp are no longer translucent (about a minute or so). Remove vegetables (should be fork tender) and shrimp from the broth. Taste broth again and adjust seasoning to taste. Strain the broth through a fine sieve or cheesecloth into a saucepan. Taste and adjust seasoning according to your palate. Add a few drops of lemon to taste. Top with olive oil and Pernod. When ready to serve, top each halibut fillet equally with the broth. Perhaps top the halibut fillet with chervil pluches (the top, stem free part of the chervil herb) or any fresh herb garnish from your garden. DO NOT use dried rosemary, fresh thyme or any other "hard herb" to top the halibut, for these herbs need time to release their oils and flavor thus making the last moment garnish obsolete. Serve right away, piping hot. This halibut dish should be accompanied by toasted croutons topped with aioli or rouille. Read other articles on The Culinary Institute of America in the Restaurants, Gastronomy, and Chefs' Recipes sections. Please read about Dutchess County in the Destinations, Hotels and Resorts, Restaurants section.